There’s no place in the world where more truths are readily apparent than the stage of a karaoke bar. It’s a leap of faith and a baring of the soul to pick a song and step up before a crowd of friends and strangers alike, standing and delivering with your voice in the words of others. You want to be someplace comfortable and inviting, because who knows where the night may take you? The proverbial Groucho (he told me the name his parents gave him when I met him, but I soon forgot it – everyone I know calls him Groucho, so that’s good enough for me) filled a need when he opened his spot a few years ago. Until then, Akiko’s was the place you would find yourself, but it was often a drag. It could become a jam packed nexus point for frat dudes, wannabe gangstas, and the types of girls who get dressed to the nines to go out and flail and fail stupendously to hold their liquor. Their reputation was finally soiled forever when a fight inside led to a shooting right out in front. It’s hard to imagine Groucho’s as a place where anything like that would go down. There’s a magic to it, just something that makes you feel like you’re a guest in the home of a friend and not some shithouse-dive set up for a quick buck like so many other karaoke bars. When do you recall first becoming aware of karaoke? That was such a long time ago … I suppose I was first exposed to karaoke by a friend who fancied himself a potential rock star. He was one of those karaokers who took it a bit too seriously. He would boo people who he thought weren’t good singers and boo people based on their song selections, so for a while that was my perception of karaoke. That coupled with the fact that I thought I was “too cool” to do karaoke kept me from doing it for a while, but once I made the leap … well we see where that’s lead me. At what point did you decide that opening a bar and hosting karaoke was a thing for you? The opportunity to start my own business just kind of presented itself and at the time there wasn’t as much karaoke around as there is now and being a fan myself, I decided to open the kind of bar I would like to hang out at. I just applied that advice you hear for writers, “Write what you want to read.” I figured, as weird as I think am, if I make a place I would like to hang out at, surely there must be others. Luckily, I was right. Do you ever do karaoke yourself? Indeed I do. I tend not to karaoke when there’s a lot of people, only because I want them to have a chance to sing, but sometimes people will request that I sing a song. And do. Immediately. I used to rap and do spoken word type stuff so I already had a thing for performing, but ironically that’s what kept me off the karaoke stage – this idea that I was a “real” performer. I was pretty dumb back then. These days, I will belt out the theme from “The Never Ending Story” with tears in my eyes and without an ounce of shame. There’s more to your place than karaoke. Do you have a particular mission statement? Why would you ever think that? Are you implying I have some sort of ulterior motive? It’s not like there’s secret Illuminati meetings going on after hours just because there’s an eye in a triangle on the sign. But seriously, maybe it had something to do with growing up multi-racial in a nearly all white school (there were two black siblings and my sister and I) – I’m not sure. I know that I’ve met lots of people from all walks of life and I always give a stranger an honest chance without prejudice. I’ve learned that you can’t always judge people by how they look, or how they talk or even what kind of music they listen to. I always try to find the similarities, the common ground that connects us all, and not what divides us. That’s really what I’m trying to do with Groucho’s, bring people together who would never be together so they can see that they’re really not that different after all. We might express ourselves differently, but at the end of the day, we all really want the same things. Also I want to be filthy rich. Like Bill Gates rich. You also do things like host movie premieres, comedy nights, spoken word – your place is a place where many things happen. It was always my intent to use the place to help promote local artists. I’m a big proponent of keeping everything local and I believe that’s what makes a place unique. I’ve never understood the this corporate homogenization thing. If every city has the same stuff, why would I want to go there? I’ve had everything from experimental noise bands to pop art shows and local film screenings and it makes me feel good to be able to provide an opportunity for people to have a place to express themselves. 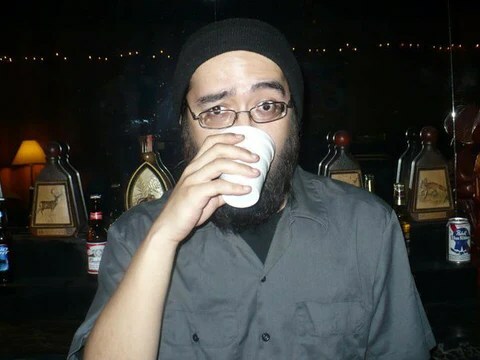 We also do an open-mic comedy show, “Comedy Attack!” twice a month. What’s the thing you wish more people understood about what you’re doing? Karaoke is about having fun and blowing off some steam. If you’re gonna be all butthurt and cursing because you have to wait to sing (even though you came in at 3 a.m. on a packed Friday night) you’re missing the point. There are twelve year olds running around in jungles killing each other with AK-47s. Your Friday night could be a hell of a lot worse. 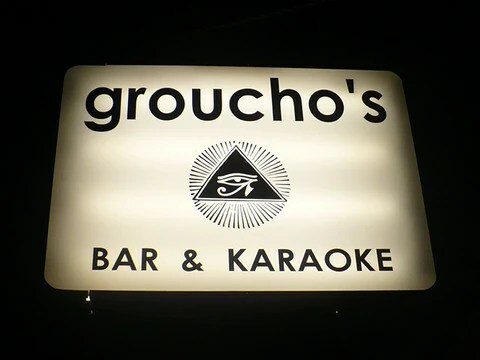 Groucho’s Bar and Karaoke is located at 935 Goss Ave. if you’re too chicken to sing, you can play the 90’s X-Men arcade game that was originally at Kentucky Kingdom and still see the stage. Because there’s no justice in the universe, he’s closing at the end of January. Go and let him know that he’s appreciated.